Every three years, the atmosphere is full of the sound of violins in Augsburg. This is the time when upand- coming violin stars from all over the world participate in the Leopold Mozart International Violin Competition, playing before a renowned jury and competing for the coveted Mozart Prize. The list of previous first-prize winners is a long one, and includes such outstanding names as Isabelle Faust, Benjamin Schmid, Lena Neudauer and most recently in 2013, Maia Cabeza. 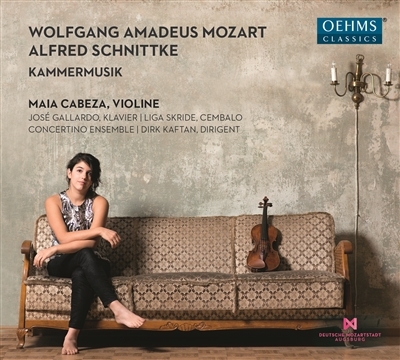 OehmsClassics is releasing a Mozart and Schnittke programme with the prize winner on the occasion of the opening of the competition and for the Presentation Concert of this CD on 2 May 2016 in Augsburg.